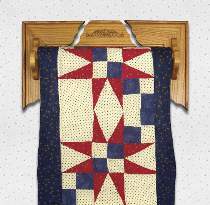 This three piece rack accommodates small to large quilts. For larger quilts, simply spread the ends to the desired width and attach them to the wall. Center the middle piece between the ends. A wood rod slips into the hook in each end piece. Cut the wood hanger strip to any length needed. Decorate with our embossed oak ornament for a truly professional look.